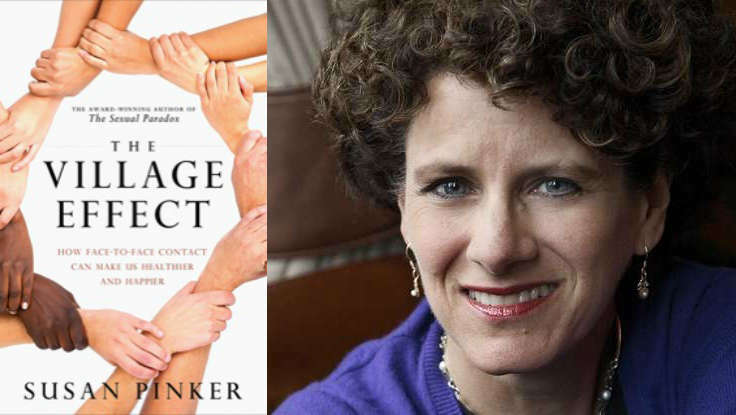 On December 19, 2014, we had a Q&A Interview with Susan Pinker, the Canadian psychologist, journalist and prizewinning author, with her latest book The Village Effect: How Face-to-Face Contact Can Make Us Healthier, Happier, and Smarter. By the prizewinning author of the internationally published The Sexual Paradox. We may seem to be connected to a larger and more diverse circle of people in this virtual age. However, studies are showing that as our Internet use goes up, our levels of happiness have gone down, and that online contact on its own does not relieve loneliness. Scientific studies of loneliness find that it drives up cortisol and blood pressure levels that damage internal organs across sexes and at all ages and stages of adulthood. In the last 40 years, there has been a 300% increase in the number of people who live alone. Those with tight circles of friends who gather regularly are likely to live an average of 15 years longer than loners. Social contact at the beginning of life helps us cope with stress later on. A hug or pat on the back lowers the physiological stress response, which helps the body’s immune system function better. Recent MRI studies show how close social contact positively affects physiological resilience—bouncing back after trauma. Women with breast cancer who have large networks of friends are four times as likely to survive as those with fewer social connections. The lowest rate of dementia appears in people who have expanded, complex, in-person networks. We are guided by Chris Peterson’s research conclusions, and his legacy: “other people matter.” Taking account of our explosion into the virtual world over the past two decades, Susan Pinker presents glaring evidence that we need a certain kind of social contact to survive and thrive—happiness and longevity can be determined and predicted more accurately by examining our social life, (rather other health factors that would seem to matter more like diet, smoking, or alcoholism). We are intensely social creatures, who have evolved to live in interconnected webs of family, neighborhoods, and friendships, with the possibility of face-to-face contact and physical proximity that can offer both practical and emotional support and sustenance. But we have lost sight of this, and even the meaning of the word ‘friend’ has been redefined by social media. Proximity—actual face-to-face contact—should be a paramount consideration as we navigate through technological and communication innovations to determine best practices and applications for education, medicine, and our own health. According to Pinker, digital devices are ideal for gaining information, for scheduling our lives, for reaching the people we want, and avoiding the people we prefer not to respond or connect to. But there are limits in what these devices and their aps, programs, social platforms, and software can provide. Humans gain significant benefits from face-to-face interaction, such as empathy, social understanding, and the firing of mirror neurons that cause us to mimic, reflect, and learn from people we are speaking to. These factors contribute to trust—and require being in the same space. Physiological changes in face-to-face interactions include a cascade of hormones and neurotransmitters that damp down stress, increase social cohesion, and improve learning and memory. Face-to-face contacts can also have meaningful effects at work. Research has shown that chatting with other employees during breaks affects productivity and satisfaction, and even casual workplace encounters can deeply impact our personal happiness as well as the company’s success. 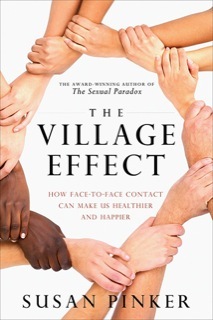 In her masterfully-crafted, engaging, and persuasive new book, The Village Effect: How Face-to-Face Contact Can Make Us Healthier, Happier, and Smarter, Pinker shows how face-to-face contact is crucial for learning, happiness, resilience, and longevity. From birth to death, human beings are hardwired to connect to other human beings. Face-to-face contact matters: tight bonds of friendship and love heal us, help children learn, extend our lives, and make us happy. The “Village” is a metaphor for the social world we build, live, and thrive within. Weaving together data from the developing field of social neuroscience and engrossing human stories, Susan Pinker documents the impact of face-to-face contact through all life’s stages and places, from cities to a Sardinian mountain village famous for residents’ longevity, from classroom to workplace, from love to marriage to divorce. Her results are surprising, challenging many of our assumptions, and yet they point towards a course correction if we want to achieve mental and physical well-being. With the increasing popularity of telecommuting and virtual conferencing, many of us spend hours alone, without actually seeing our clients or social contacts, working primarily on “devices” including phones and computers. We have left the literal “village” behind and don’t want to give up our new technologies to go back there. We are thriving professionally in workdays that depend on virtual contacts and interactions. But, as Pinker writes so compellingly, we also require close social bonds and uninterrupted, supportive face-time with our friends and families in order to survive. Even our “weaker” social contacts, by offering novel information not available in our closest circles, help build bridges to new jobs, housing arrangements, and recommended doctors. Creating our own “village effect” unquestionably makes us happier, more productive and extends our lives. It is especially important for persons who live alone and work in a virtual world to set aside time– every single day–to interact with other human beings face-to-face. Ever the clinician, Pinker gives us guiding principles for setting up and reconstructing ties that can bind us together and help each other thrive, making us increasingly conscious of our choices in connecting face-to-face: whether for a weekly soccer game or meeting with a social group, a quick lunchtime walk with a co-worker, dinner with a friend, parent, child, or partner–or all of these, on different days. Pinker’s recommendations include living in a community where you know and talk to your neighbors—at your workplace, if not at home. Building real human contact into your workday whenever possible is essential—staggered breaks which limit conversations between workers contribute to lowered productivity and happiness. Email should be saved primarily for logistics–phone or face time allows for more nuanced interactions. Creating a whole village of diverse relationships may involve building in a new habit, such as scheduling contacts with members of your village, the way you work in meals and exercise. Remembering that “the village effect” contributing to your survival is heightened by proximity, you adjust the ratio of your face-to face to screen time according to your individual temperament–just as you adjust food intake according to your appetite. To respond to increasing use of digital and virtual interactions in education, medicine, and even child care, Pinker highlights the importance of maximizing access to face-to-face connections, especially for young children through adolescents who are still absorbing the social skills, emotional dynamics, and networking processes they will use later—as they construct and maintain their own villages. “In this provocative and engaging new book, Susan Pinker shows how intimate social contact is a fundamental human need, and argues that Facebook, Twitter, and the rest of social media fail to meet this need, diminishing the lives of children, teenagers, and everybody else. Pinker is a great storyteller and a thoughtful scholar, and she expertly blends together personal stories and scientific research about marriage, cancer, obesity, happiness, longevity, religion, menstrual synchrony, solitary confinement, and much more. This is an important book, one that will shape how we think about the increasingly virtual world we all live in.” —Paul Bloom, Brooks and Suzanne Ragen Professor of Psychology, Yale University, author of Just Babies: The Origins of Good and Evil. Susan Pinker received her BA from McGill University in 1979 and a Master’s of Science (MASc) in Clinical Psychology from the University of Waterloo in 1981, after which she spent 25 years in clinical practice seeing thousands of patients at schools, hospitals and social agencies. During that period, she also taught psychology, first at Dawson College, then at McGill University’s Department of Educational and Counseling Psychology. But Susan had long wanted to write most of the time. The writing gene runs in her family: her brother is Steven Pinker, an evolutionary and cognitive psychologist, linguist, and bestselling author (MentorCoach’s September 2014 interview). In a chance encounter with a health writer Susan was barely acquainted with (drawing on a “weak” social connection), she received help in making a shift–from work as a clinical psychologist who sometimes wrote newspaper articles to a writer who occasionally practiced psychology. By 2004, Susan had decided to write full-time. That included (until 2012) weekly commentary and advice columns for Canada’s national newspaper, The Globe and Mail, entitled “Problem Solving” and another, The Business Brain. In 2008, Susan published her first book, The Sexual Paradox: Extreme Men, Gifted Women, and the Gender Gap, which has now been sold in 18 countries and translated into 12 languages. In 2009, this book and its author received the most prestigious literary prize offered by the American Psychological Association, the William James Book Award. 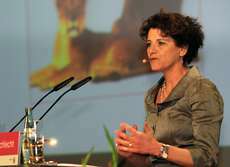 Susan’s ideas have been featured in the popular media, including the New York Times, The Times of London, The Economist, The Financial Times, The Today Show, Oprah Magazine, and Der Spiegel, among other publications. Susan’s weekly newspaper columns are opportunities to apply her knowledge of neuroscience and behavioral economics to the business world. She has presented monthly radio commentary on the CBC, and written opinion and feature articles on psychology, public policy, education, and business for the international press—supporting her position or infusing the content with recent scientific findings. As she was working on the research for her first book, The Sexual Paradox, Susan was surprised to find that women who had expanded, complex, in-person social networks experienced less dementia. In fact, writing The Village Effect has changed Susan’s own life for the better: she has become “more intentional” about her habits and aware of the trade-off of any time spent connecting on social media, since it leaves less time for more essential in-person contact. “The come-hither aspect of ‘electronic media’ keeps making it harder for us to differentiate between actual and virtual human contact,” she notes. As a writer, she could go a whole day without doing anything “expressly social” but now makes a point of getting face-to-face on a daily basis—even if it’s with a local librarian or someone she might frequently encounter at the market. Mapping out her own social network in The Village Effect, Susan shares her experience and recommendations for widening networks and building strong in-person contacts, especially as we age. 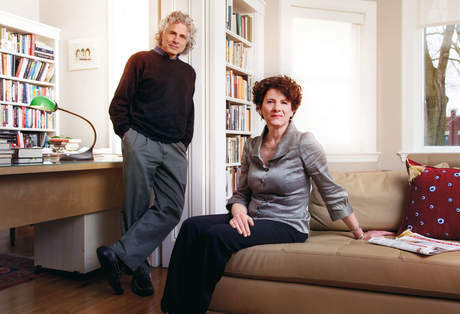 Susan with her brother, the internationally renowned cognitive psychologist and author, Steve Pinker. Psychotherapy Networker Review of The Village Effect, an excellent review. 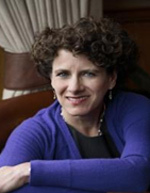 The Village Effect—An Interview with Susan Pinker. The Hedgehog Review. Nov 18, 2014. Cindy Hoedel: Face time with friends could extend your life—so log off and meet up. Kansas City Star Magazine. Nov 22, 2014.